This well-composed painting from Mughal India is unmistakably of Mary presenting the infant Jesus probably to the three Magi (most accurately translated as ‘astrologers’ rather than’ wise men’. It was after all s star that lead them to the scene of the Nativity). An alternative view is that the picture shows the Holy Family, Saint Anne and the two angels with Joseph pushing aside a large curtain so that Saint Anne can behold the baby. Artists in India were influenced by European artistic modes and themes from the sixteenth century after a Goa-based Portuguese Jesuit mission was permitted to Emperor Akbar’s court in 1580. The missionaries brought with them several pictures (most probably engravings) of the Madonna and Child and right away these ignited the curiosity of the Mughal Court painters. Badauni, a biographer of Akbar, mentions that Abu’l Fazl, the royal biographer was entrusted to meet the mission and translate the Bible into Persian. Akbar sent a mission to Goa and to Spain which brought back a copy of Bible. The subsequent influence provided a whole range of new subjects, sometimes executed in a more European manner and other times, as in this example, with strong allusions to a more typically Indian style. The Mary figure here wears her cloth mantle but also a Mughal-pattern floral gold dress. This and the architectural background and perhaps the jewellery all demonstrate this merging of styles. Such images often were copied from one another and so it is with this example: it is a nineteenth century copy (it might be earlier but the light surface crazing of the picture and the form of the paper and cardboard on which it is stuck down all suggest at least a nineteenth century dating) of an earlier Mughal miniature which is in the Chhatrapati Shivaji Maharaj Vastu Sangrahalaya (formerly the Prince of Wales Museum) in Mumbai. This painting is illustrated in Desai (2002, p. 92). A version was reproduced on a 68p Christmas postage stamp issued by the UK’s Royal Mail in 2005. 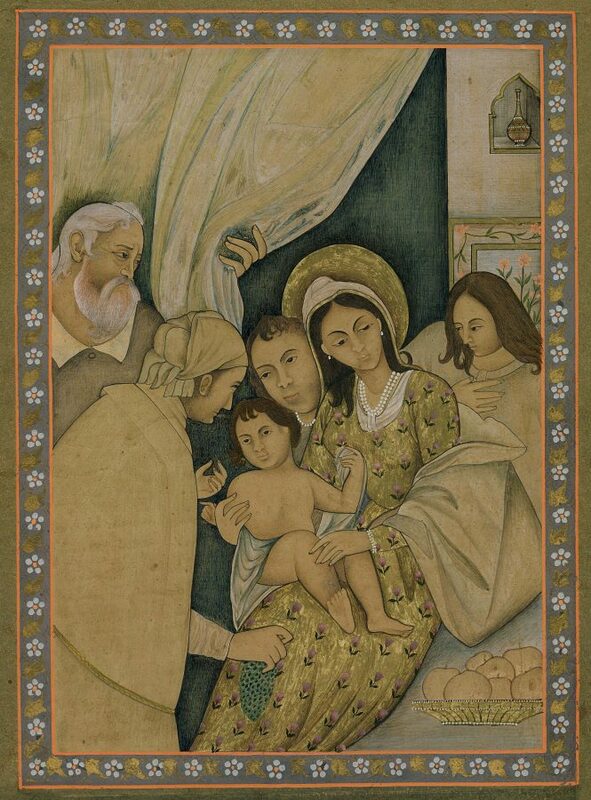 This painting itself might be a copy of another eighteenth century miniature which is the National Museum in Delhi. The National Museum miniature itself is a copy most probably of a sixteenth century European engraving by Aegidius Sadeler. Another derivation of the painting is in the Nasser Khalili Collection.